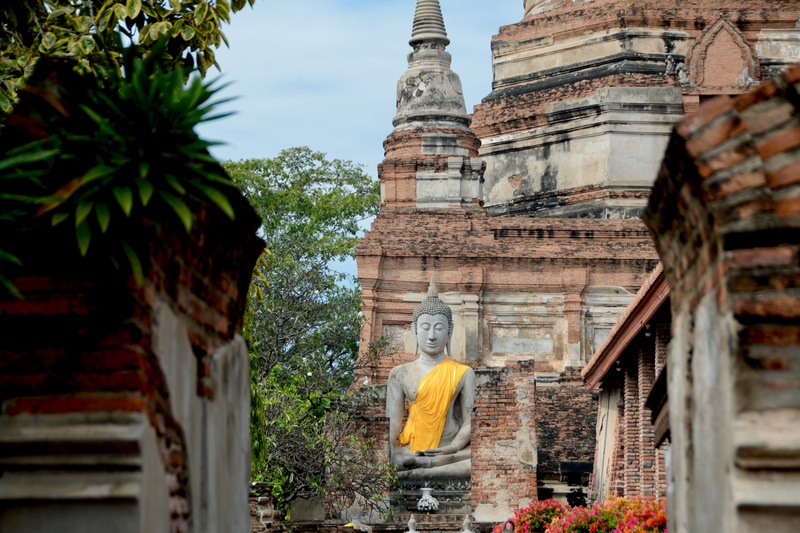 We enlisted the help of Bangkok Food Tours to arrange a day tour to Ayutthaya, which was the ancient capital of Thailand and is now recognized as a UNESCO World Heritage Site. 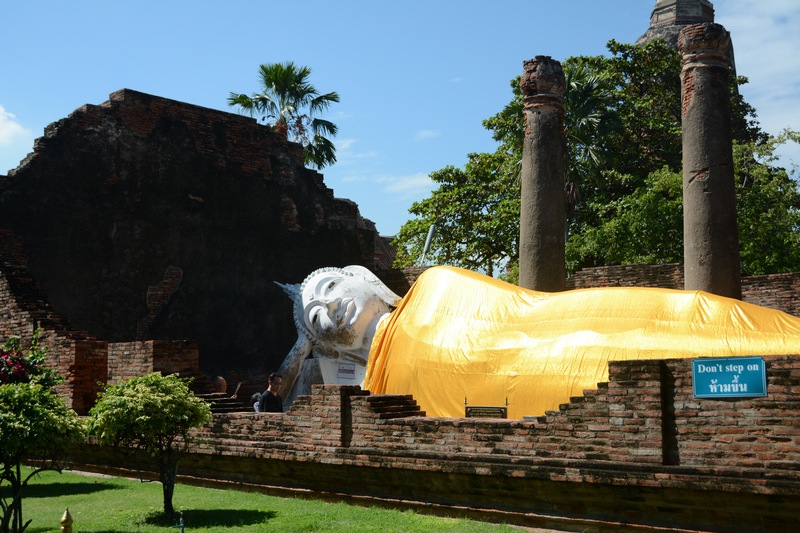 I was interested in getting to see another city other than Bangkok and figured that Ayutthaya would be a perfect choice with all of it’s rich history. Our 3rd day in Thailand started off with an hour and half drive north of Bangkok and our first order of business was stopping in at Pakwan Restaurant for a little breakfast….well more like a lot of breakfast! The first dish that we tried was Tom Yum Noodles which translated means boiling mix flavor noodle. As with a lot of Thai food, it was the perfect blend of sweet, sour, spicy and savory. Next was Gway Teao Lwei Swao which was minced chicken and herbs rolled inside rice noodles. 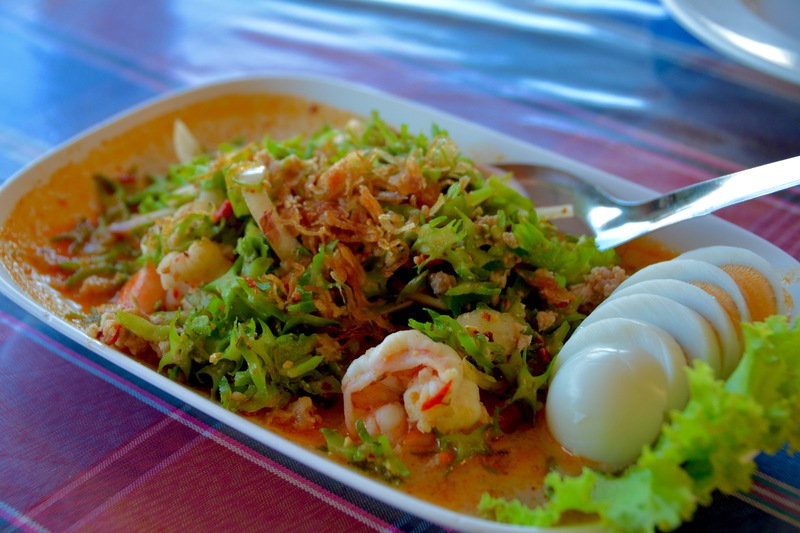 It was one of our favorite dishes from the whole trip, the dish was just super fresh and flavorful! While we were eating, we were educated on how Thai people use silverware, hold the spoon in your right hand and the fork in the left so that you can use your fork to push food into the spoon. Our guide also told us that people often use the spoon as a knife. 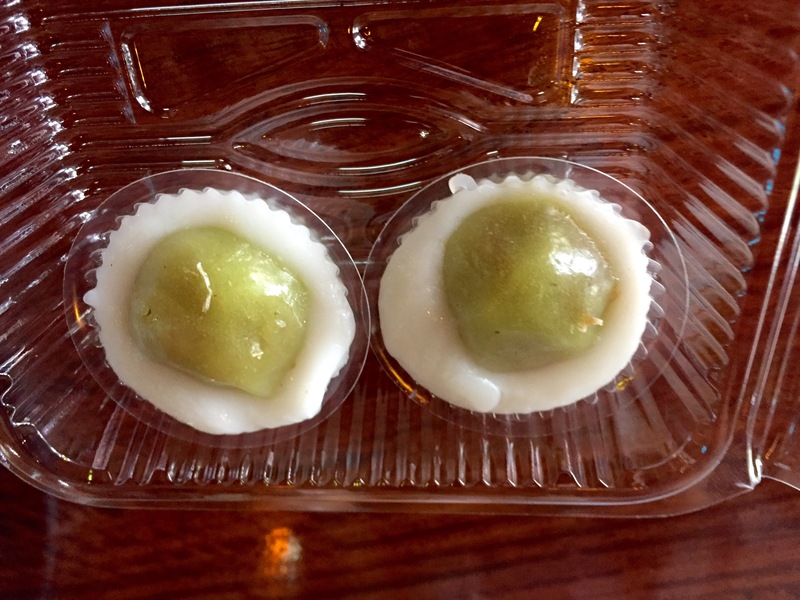 No meal is complete without something sweet, so we tried Kanom Sod Sai which was a dessert made with coconut and had a soft outside and chewy tapioca. It was light with just the right amount of sweetness. Right before we were about to get back into the car, the guide took us to grab some of these colorful little guys. 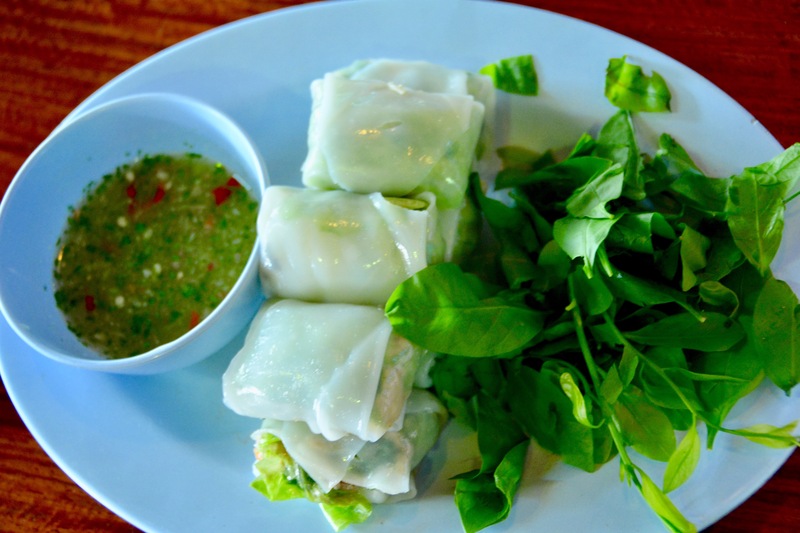 They are filled with a sweet and savory peanut mixture inside and the outside is a chewy rice paper. The most interesting part is that they include an additional element with the small chilis! The little chilis were spicy, but a great addition to the sweet and savory of this dish. Our first site of the day was Wat Yai Chai Mongkhon (Mongkol) which was built in 1357 A.D. Our Guide had told us that there were 503 temples in the city, so this is one of many! We were told that monks only eat 2 meals each day and that they can’t eat after 11 AM! I would definitely fail as a monk…. So since it is very important that they get their 2 meals a day in, they bang a drum and a gong at each meal to ensure that everyone knows it’s meal time. Those around the temple who wear white robes are nuns and those who wear gold robes are monks. 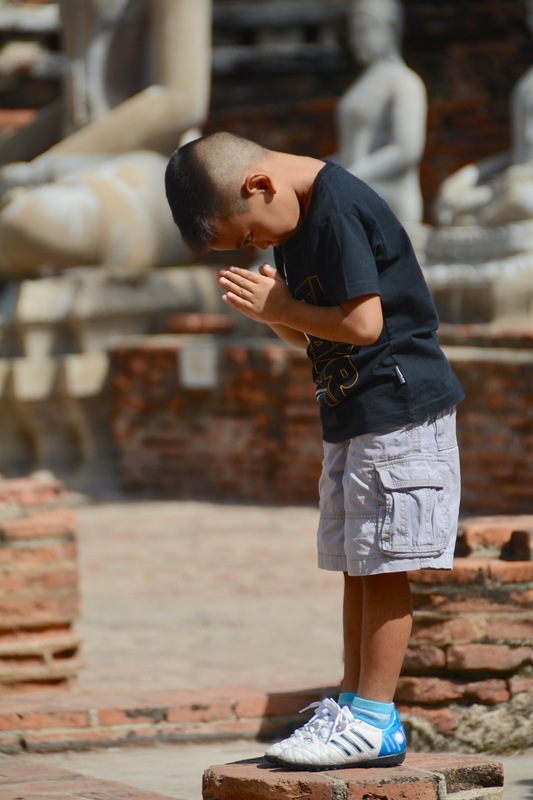 All Thai men who are Buddhist must become a monk before they are married. They usually join the monastery for about 3 months, then they are free to leave the monastery and have a family or remain there and dedicate their lives to being a monk. The next temple we went to was Wat Phanan Choeng Worawihan. This temple is known for the 19 meter high sitting Buddha. The temple is very popular as evidenced by the number of worshippers (many bringing their entire families) taking up the floor space around the Buddha in prayer. Then it was time to stop for lunch. Our guide told us about the famous dish known as “Boat Noodles.” They are named this because these noodles used to be famously sold in the canals of Bangkok. The “special ingredient” for this soup is that it is made with pig’s blood. We figured if this was one of the most well known dishes and the restaurant was packed that we should give it a try! 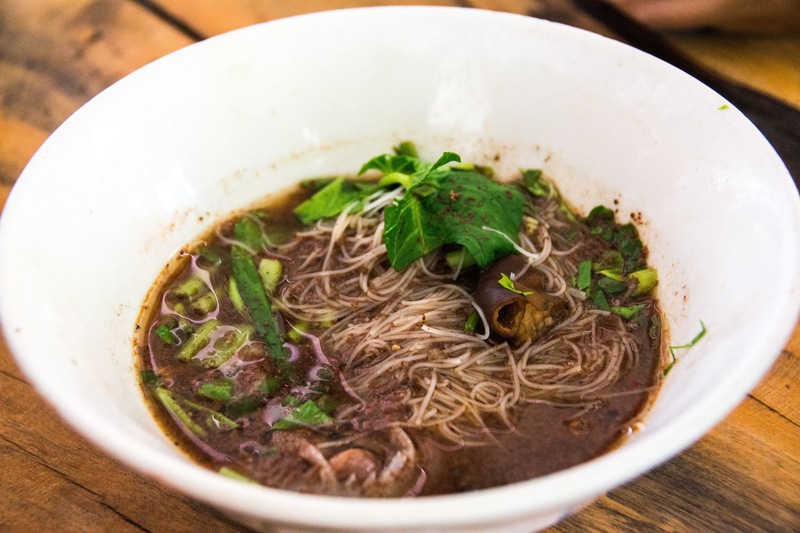 The soup is definitely dark in color, inside the bowl there are thin rice noodles along with some meat and herbs. The blood is thinned out with some broth and the soup ends up being very sweet and tangy. If we hadn’t been told there was blood, I might not have known. I honestly didn’t love the very sweet tangy flavor, so the noodles were only okay for me. It’s not something I would order again most likely. For our next stop, we went next door to see how Roti Saimai is made which is basically Thai cotton candy wrapped in a sugar pancake (almost like a really chewy crepe). I did not think that this was going to be very tasty, but it was soooo good! They actually hand make the “cotton candy” filling. There are also different flavor pancakes, like pumpkin. However, we really loved the original flavor as it had the delicious coconut milk shining through. After lunch came a nice relaxing river cruise. 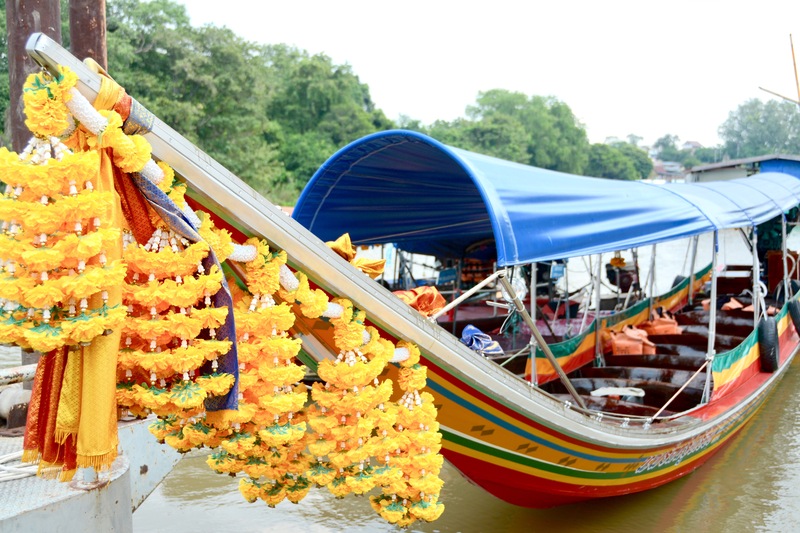 We toured around the Chao Phraya, which is the same river that goes through Bangkok. As we went around, we saw plenty of local life along the banks, from people resting, fishing, to a man washing his dog in the river. We stopped off at Wat Chai, which has corn cob pagodas that were built over 600 years ago. As you can see, the heads of the Buddha’s around the temple are all missing. They went missing after the destruction of the capital in 1767 by the Burmese. Theft of the bricks and the Buddha’s was a common occurrence during that time. Next up was a visit to Wat Loka Sutha, which is known for it’s large reclining buddha which is 37 meters long and 8 meters high. After the reclining buddha, we were off to Wat Phra Si Sanphet , also known as the Grand Palace (I told you there were a lot of temples!). This was known as the most beautiful temple of the old capital and is situated on the premises of the royal palace. The temple was only used by the Royal family and was also used for royal ceremonies and where the royal family’s ashes were preserved. No monks ever resided here. The last temple of the day was Wat Maha Tat also known as the Temple of the Great Relic. 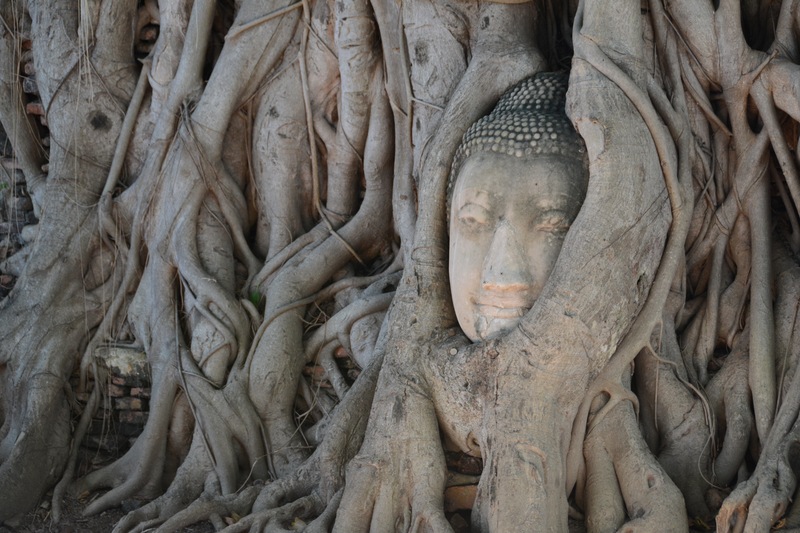 One of the main attractions at this temple is the Buddha head in tree. We were told that this draws many visitors to the temple as the head was not placed there but fell there during reconstruction of the temple. We wrapped up our long day of site seeing at the Ban Watcha Rachai restaurant on the Chao Phraya river. Honestly, we were so stuffed at this point, but we had to power through! I’m really glad we did as we had one of my favorite dishes of the trip here. Yum Tua (wing bean salad). The wing beans (like green beans) are tossed in a red curry sauce and just a wonderful mix of flavors. SO delicious. 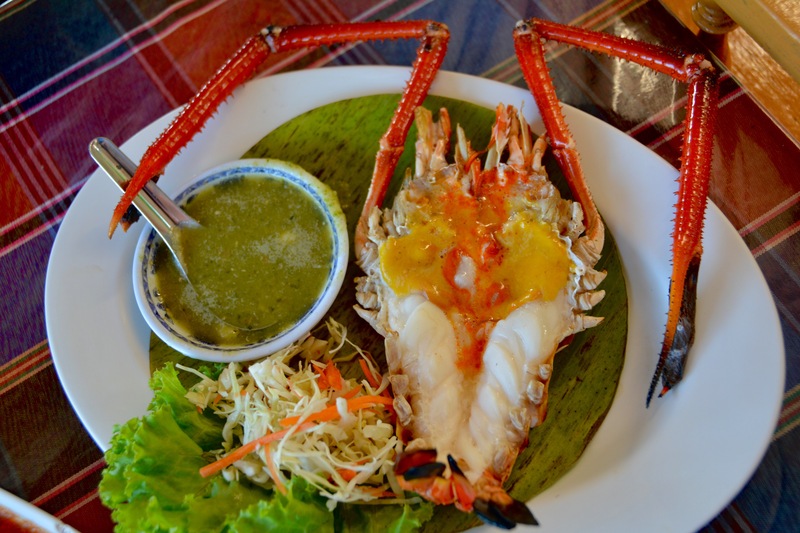 Look at the size of this BBQ River Prawn! Super fresh and meaty, YUM! All the dishes were delicious (fish in Red Curry, Loh Choeng (Dessert with rice noodles and taro, melon and coconut milk), snakehead fish) and like nothing we had ever had before. 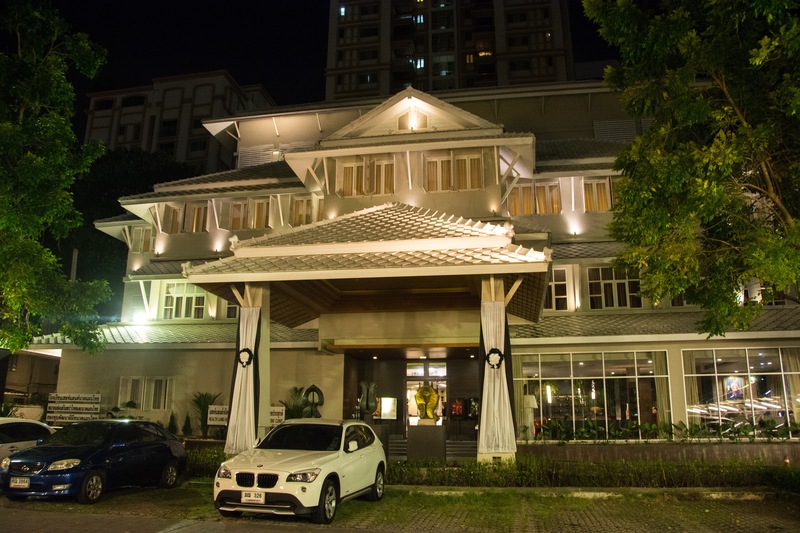 Once we arrived back to Bangkok, we made an appointment at Health Land for a well deserved massage. Health Land is huge facility, but make sure you call ahead for an appointment as we tried to walk in the day prior and they were totally full. We had a full day of eating new foods and very interesting site seeing. Scott and I both agreed that Ayutthaya has its own unique flair and there really are a ton of temples, just like the guide said! I would definitely recommend a visit there if you can make the time and Bangkok Food Tours did a great job with our itinerary for the day! Next stop of our trip is the Maldives for some rest and relaxation, can’t wait to share paradise with all of you! !